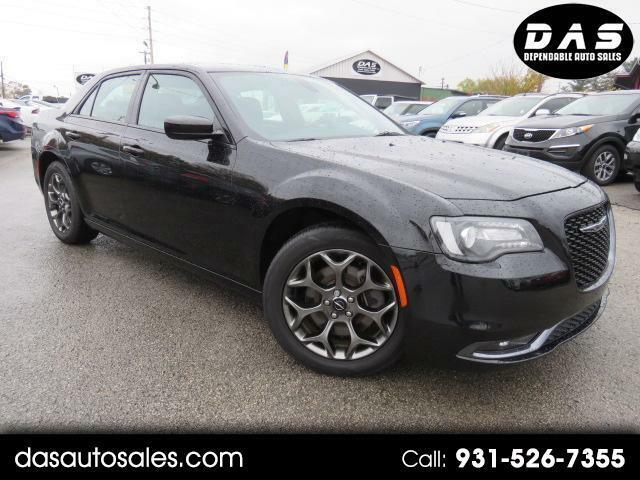 A knockout in Gloss Black, our 2016 Chrysler 300 S AWD is the benchmark of perfection with an exceptional combination of performance and efficiency. The award-winning 3.6 Liter Pentastar V6 delivers 300hp and is perfectly matched to an innovative 8 Speed Automatic transmission with Sport mode to reward you with best-in-class fuel economy of 31mpg on the open road. Smooth, agile and composed, our All Wheel Drive Sedan offers world-class comfort you'll look forward to each day! Enjoy the allure of our 300 S with its graceful, yet aggressive stance that is highlighted by dual sport exhaust, bold wheels, and bi-function halogen projector headlamps. A haven of luxury and technology, the 300 S cabin greets you with a wealth of amenities including remote start, dual-zone automatic climate control, a rearview camera, and heated leather-trimmed sport seats. Enjoy next level connectivity with the Uconnect touchscreen display with Siri Eyes Free, Bluetooth streaming audio, voice command, available WiFi, Beats audio, satellite radio, and other top-shelf amenities as you take in this refined ride. You'll have peace of mind thanks in part to excellent visibility and advanced safety systems from Chrysler such as traction/stability control, advanced airbags, and more. Capable and confident, our Chrysler 300 is a sedan with sophisticated style and a powerful presence you've got to feel for yourself! Print this page and call us Now... We Know You Will Enjoy Your Test Drive Towards Ownership!